Are you one of those people who would love to be organized but think you don't have the time? The truth is being unorganized is the time-waster, causing you to spend valuable minutes searching for items. We have rounded up some of the easiest and most creative DIY organizing tips to use in your Springs Apartments home. And since we've saved you all that research time, why not get started today? Lids for Tupperware and other plastic food containers are the cause of one of the more annoying kitchen storage problems. A metal CD rack placed inside a cabinet is a great, ready-made solution. Arrange the lids with the larger sizes in back and smaller ones in front. If you prefer a more colorful solution, use scrap material to make a fabric lid holder to hang on the inside of the cabinet door. Don't toss away those plastic coffee creamer bottles. Simply remove the label and you have handy, quick-dispense containers for nuts, chocolate chips, cheddar goldfish crackers, sugar or other food items. Instead of trying to stuff plastic bags inside a drawer or tuck them in the corner of a cabinet, store them in an empty disinfectant wipes container. Vanity space is always cluttered up with hair dryers, curling irons and flat irons. 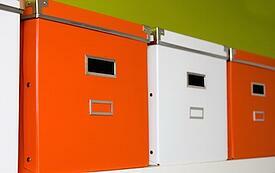 Use adhesive hooks to hang a mesh file box from the wall or on the side of a cabinet. Hair appliances will stay out of the way and still have a place to cool off. A shoe organizer is the jack-of-all-trades of storage accessories. It can hold cleaning products, tools, toys, belts and scarves, and just about anything else you can think of. Since it hangs vertically, it takes advantage of space that otherwise goes unused. This creative metal-hanger holder is perfect for storing flip-flops, but can also work for belts and scarves. Place a magnetic strip inside the medicine cabinet door to hold bobby pins, tweezers, nail clippers and other metal grooming items. Do you get frustrated trying to find homes for smaller items like thumbtacks, paper clips and hair bands? Stock up on plastic travel soap holders at the dollar store. They're also handy for kids to take playing cards, crayons and small toys on road trips. No matter how carefully you pack up holiday ornaments, you're likely to find at least a couple broken ones the following year. Take some plastic cups and glue the bottoms to a sturdy piece of cardboard. Place one ornament in each cup and stack the layers inside a plastic storage bin. Not only will they stay in one piece, you won't have to untangle all the hooks. Here's another cardboard-based solution for holiday storage: wrap strands of lights around a large square of cardboard or an empty wrapping-paper tube. It's said that necessity is the mother of invention.Has a particular storage problem inspired you to come up with an ingenious solution? Share your ideas in the comments!